Comte Henri de Colbert, Château de Flaugergues. Born in Monsabon, Jacques-Henri Gabriel de Bellissen, who came from a long established noble family from the Languedoc, married Amélie Bavrin de la Galisonnière in 1806/7. They had a daughter, Flora, who married Ferdinand, Comte de Mesnard in 1887. 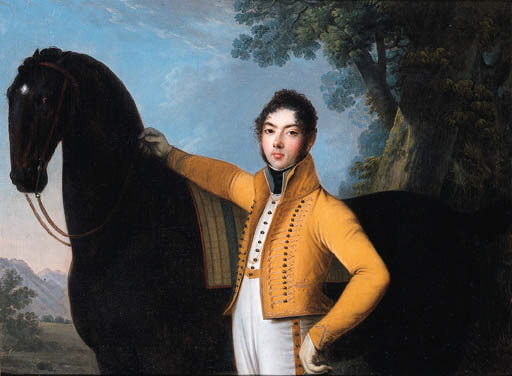 The present work depicts Jacques-Henri de Bellissen as a chambellan under the empire at the age of about twenty-five, a position he held through the reigns of both Louis XVIII and Charles X. In a letter patent on September 9, 1810 he was appointed Comte de l'Empire .